Surgeries can be really stressful things to undergo. Just the thought of having to go for surgery can make anyone queasy! And it is perfectly understandable why – the idea of having your body opened up is…. not very pleasant, to say the least. Luckily, medicine has advanced to the point where we can keep those openings as small as possible! Alas, not every surgery can be performed through keyhole-sized incisions. This Dad unfortunately had to undergo open-heart surgery. Luckily, he is doing fine now, and is healthy enough to have his beautiful Golden Retriever pups, Jake and Zoey, to visit him! 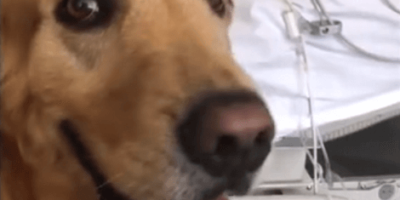 Parents of Golden Retrievers may be astounded by just how calm these pups are, even if they are clearly very happy to see him! Golden Retrievers are well known to be pretty energetic, but it seems that these pups know that they have to be gentle around Dad for a while! Ooh This Adorable Pup Is In The Mood To Scare People Today!